From its launch in 1998, the UM Arts of Citizenship Program helped to research and present Michigan's rich African-American history. Some projects involved performances with Detroit's Mosaic Youth Theatre and Matrix Theatre Company (read about them here and here). Another, Memories From Hamblin, worked with Heritage Battle Creek to create a website about the history and displacement of that city's African-American neighborhood. But our first black-history partnership focused on the Underground Railroad. Southeast Michigan was a key route for enslaved people fleeing the Mississippi Valley for Canada. 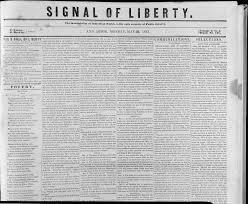 The local African-American community held a trove of family and community lore about safehouses and conductors; an important antislavery journal, The Signal of Liberty, had been published in Ann Arbor. Arts of Citizenship had begun to explore this history in our Students On Site curriculum project (described here). That led a local heritage association, the African-American Cultural and Historical Museum of Washtenaw County, to ask us to help expand their research and educational programs. We convened a research team that included AACHM experts Willie Edwards, Vivian Lyte, and Karen Simpson, UM faculty Matthew Countryman and Joyce Meier, Arts of Citizenship project leader Carol Mull, and students from my Community Projects In the Arts and Humanities seminar (syllabus, 2000). Researchers read and digitized The Signal of Liberty and scoured historical societies and antislavery archives in Ohio, Ontario, and Ann Arbor. We documented some two dozen conductors, many local safehouses--including the home of Guy Beckley, co-editor of The Signal of Liberty--and many first-hand accounts of freedom journeys. Drawing on census and other materials, we learned much about African-American communities in antebellum Washtenaw County and Buxton, Ontario, across the Detroit River. Our Museum partners developed educational materials and a bus tour of Underground Railroad sites in Ann Arbor and Ypsilanti. Carol Mull went on to partner with the Ann Arbor District Library to produce a full online archive of The Signal of Liberty. The project also created a traveling exhibition, "Midnight Journey." It was developed to accompany Along the Tracks, a children's play about the Underground Railroad in Michigan, commissioned by Ann Arbor's Wild Swan Theatre. Curated by Carol Mull and designed by Lynne Friman, the walk-through stations posed questions like "Why Would You Want To Escape?," "How Would You Find Your Way?," and "Whom Would You Trust?" It used maps, images, objects, and age-appropriate text to teach about the experience of escapees and conductors. 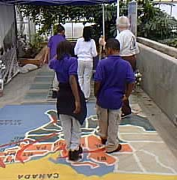 After the run of Along the Tracks, the exhibition was displayed in schools, libraries, historical societies, and other venues across Southeast Michigan and Ontario. It was eventually seen by more than ten thousand visitors. The Underground Railroad partnership brought together scholars, students, and community experts to uncover and present a story that no one could have told so fully on their own. Integrating public history, exhibition design, performance, and experiential learning (for both children and college students), it illuminated an aspect of our history that was partly known in the African-American community and unknown in the community-at-large.